It’s been awhile since we had some good yellowtail photos to post up but we finally got a few this week. 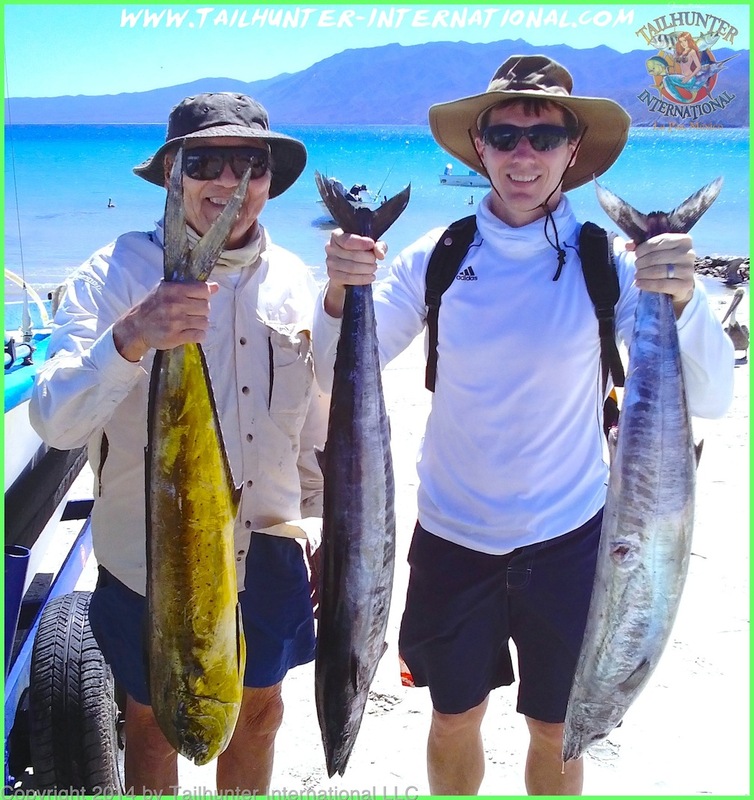 Captain Joel and our great amigo, Rod Brown from Alaska pose with a nice pair of forkies taken north of La Paz! And dorado too? 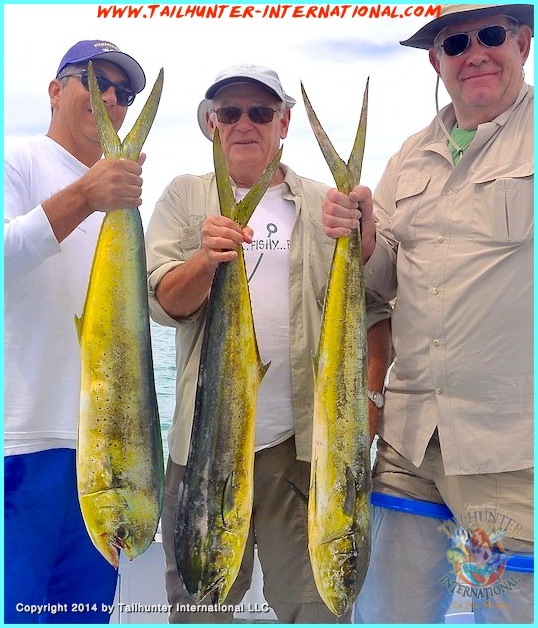 Triple shot of mahi for Captain Joel, Jeff and first-timer Miles Brown. 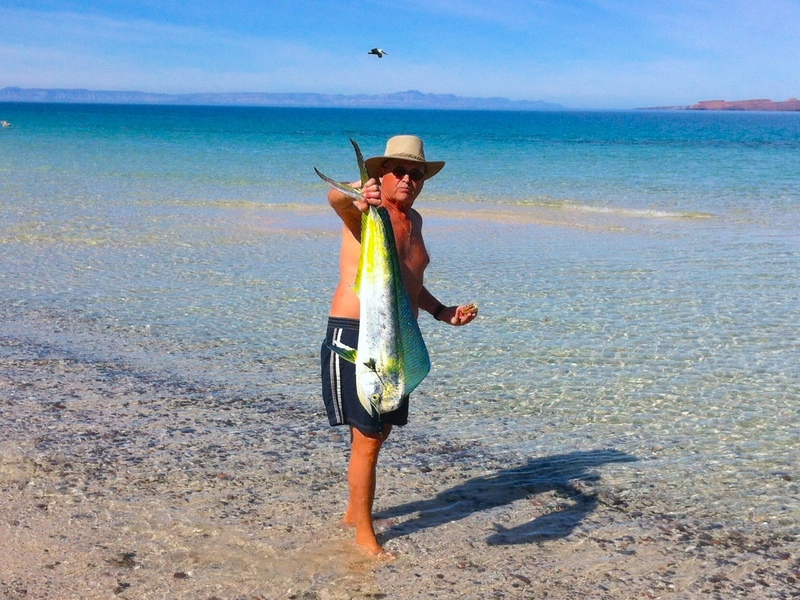 All the way from Minnesota, Jeff Brown, stuck this trophy yellowtail near Espirito Santo Island north of La Paz Bay. Great eating and a super-sized cabrilla (Mexican seabass) for Jeff. Except for a few breezy days, it was more like late spring/ early summer style fishing this past week. Air temps were in the low to mid-80’s and actually pretty pleasant. Water temperatures which have risen unseasonably high have been in the mid-70’s to low 80’s. The resulting effect was a decent mix of fish. Some cool water fish. Some warm water fish. But, overall a nice variety. 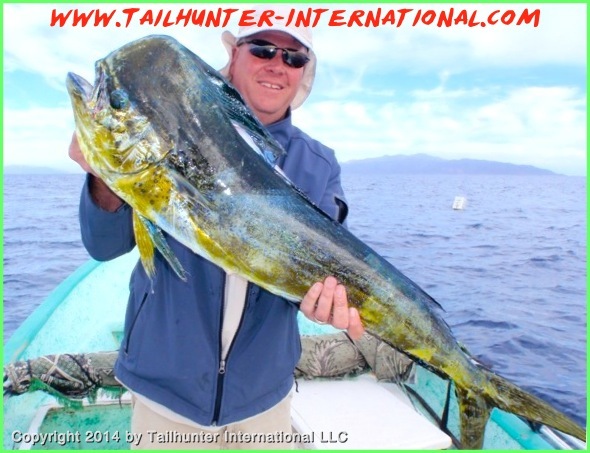 The cooler water fish mostly taken inshore and in shallow areas included some nice yellowtail up to 25 pounds. Nothing widespread, but a smattering here and there. As well, we took some nice slugger pargo, cabrilla and sierra around both islands. 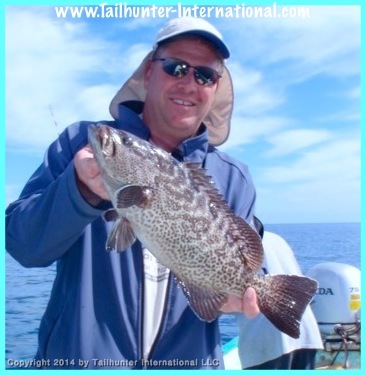 Some good fish were lost to the rocks…not unusual when big fish are holding close to structure like reefs and rocks! 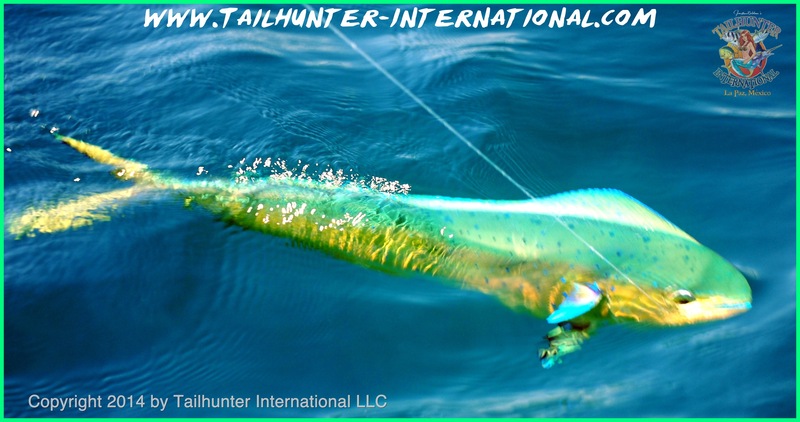 Warm water fish…well, once again…dorado! We’ve been getting them on and off for about 2 months now. Way early for a normal season, but once again the warm water species were found anywhere from the islands, to the shallows around the beaches, near the buoys and free-swimming in the channel. No great numbers, but every day a few dorado here and there. Mixed with the other species, it made for some interesting boxes of fish coming back in our pangas each day. We’re going to keep an eye on these water temperatures! Those temperatures will dictate what we’ll be catching. THANKS EVERYONE! ANOTHER ONE FOR THE BOOKS! We’re finally headed home to La Paz. After almost 3 months on the road encompassing almost 15,000 miles of driving…9 states…10 hunting and fishing shows including: Sacramento, Denver, Puyallup (Seattle), Portland, Yakima, Phoenix, Boise, Long Beach, Salt Lake City and this past week in San Diego. Whew!!! And what a grand time we had…almost 20 years doing this now and every year it just gets better and better! Jill and I want to thank all our amigos who came to see us at the shows and everyone during the 3 months for their friendship, support, encouragement and smiles. And to all our friends for making us feel welcome and all the hospitality on the road…all the gifts…food…drinks…invitations…Tailhunter tribe members are the best! Now, let’s head home to La Paz and get some fish! God bless you all! Dorado were the mainstay for our anglers this week as waters up to 80 degrees have moved into our fishing holes bringing the warm water species as well. This female was hooked just outside of Bahia de Los Muertos and released, but we’ve been getting some bulls up to 20-25 pounds. Inshore action has been good for light tackle and the flyrod like this cabrilla (Mexican seabass) that Dennis McGuffee caught fishing with Captain Archangel from Tailhunters. Dennis is from Colorado. Here is why we’re getting so many warm water fish…WARM WATER! This is the latest ocean satellite reading from http://www.terrafin.com showing water temps. The copper colors are in the 80’s and the greens are the high 70’s! After 3 months on the road, we’re back in home grounds of S.California for the Fred Hall Fishing Show at the Del Mar Fairgrounds in San Diego! Show is from Thursday to Sunday! 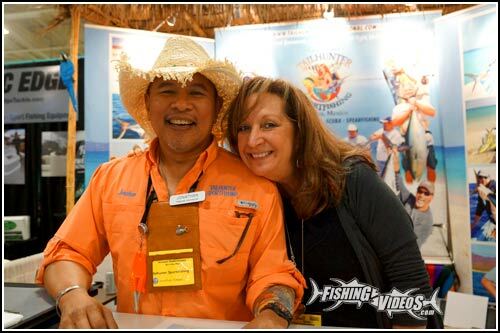 Come visit us in the booth and set up your 2014 La Paz fishing trip! Unless something dramatic happens, which might not be good, I would venture to say that cold-water fishing is pretty much done for the year. Given the patterns and catches all winter, our chilly-water season has come and gone…what there was of it! Whether that’s good or bad depends on how you look at it. For fishermen coming in the spring to chase yellowtail, I think they might be disappointed. There’s still yellowtail around, but certainly not in the numbers we’re used to seeing this year. Our divers say there’s a colder water thermocline down deep that seems to be where the fish are holding. But, the warmer waters on the surface…up 78 degrees around Cerralvo and into the 80’s on the outer banks! There are still some other species around that are great fun like the spawning pargo and reef-bound cabrilla, but frankly no one has really been chasing these challenging species, not when there’s top water species around that are easier to catch and less frustrating. That would be the other way to look at things. 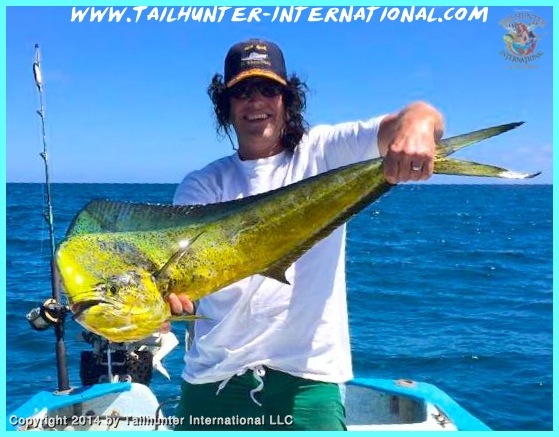 No sense in chasing bottom fish like pargo or amberjack that will bite, but will frustrate the anglers and possibly send them home with empty fish boxes when dorado are swimming around and make for fast action and great fun and Kodak moments on the beach. 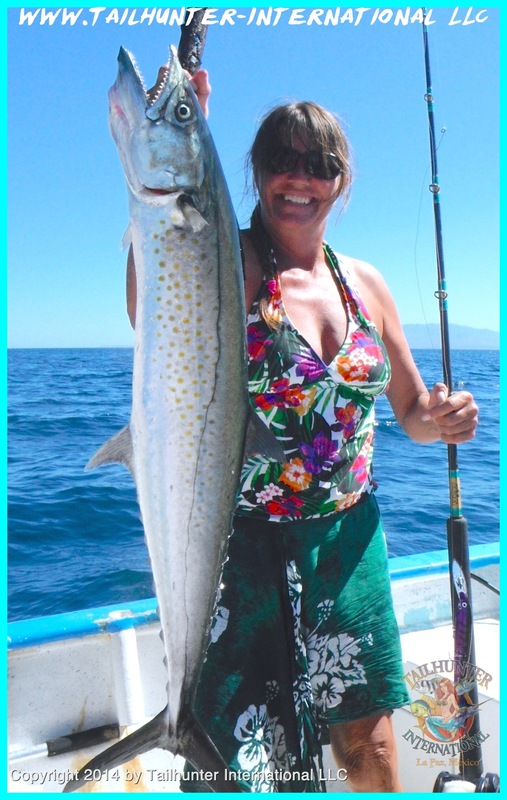 Same with cabrilla which are tasty and small…3-5 pounds…then there’s 20 pound dorado swimming around. Yes…20 pound dorado…and some larger! This past week our some of our pangas got limits of dorado up to 25 pounds…plus cabrilla…plus a few small roosters…bonito and jack crevalle. Good action. 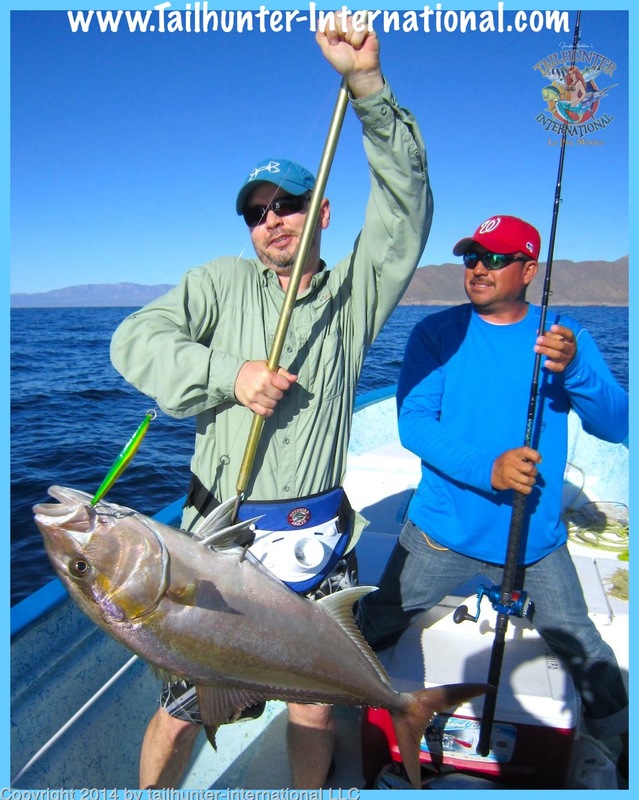 There were some yellowtail caught by commercial guys around Cerralvo Island and north of La Paz, but early in the week there were some huge winds that kept everyone close or not even going out. At the beginning, I said that a dramatic change might not be good. Given the current warmth of our waters, if something dramatic happens, like a sudden decrease in open temperature and everything got cold, I don’t think that would be a good thing. In our past experience, that might just shock the waters and the fish. The waters would turn green and murky and fish wouldn’t bite. That’s just speculation on my part, but I’d rather have fish biting than possibly none at all! Even if they are dorado and billfish! Nothing wrong with that. And nothing wrong with the ocean either! It’s just another cycle that we go through and this year just happens to be warmer than normal! END OF THE ROAD! WE’LL BE IN SAN DIEGO THIS WEEK! 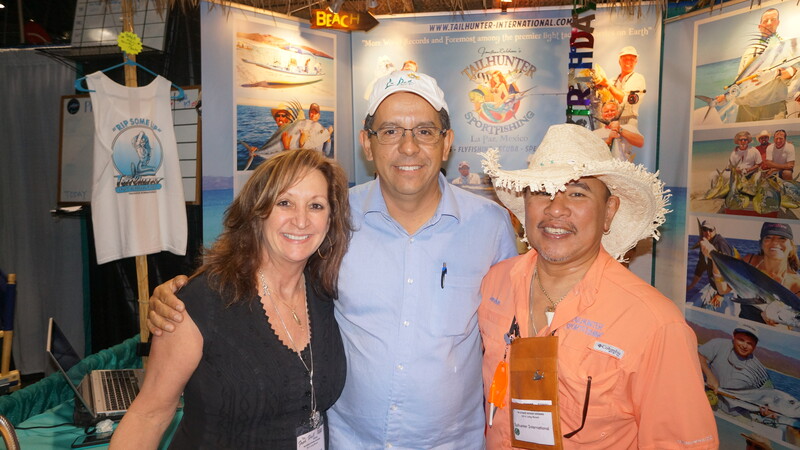 Sr. Agustin Olachea, head of the La Paz Hotel Association, came all the way up from La Paz to visit us at the Long Beach Fred Hall show! 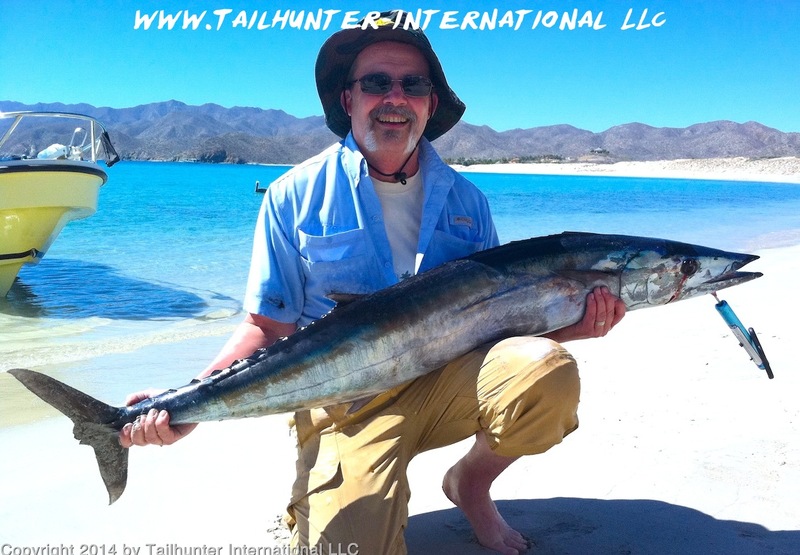 He does alot to help bring tourism to La Paz and Baja, Sur. Great to have him visit us to see what we do at the shows! We’re coming back to La Paz! 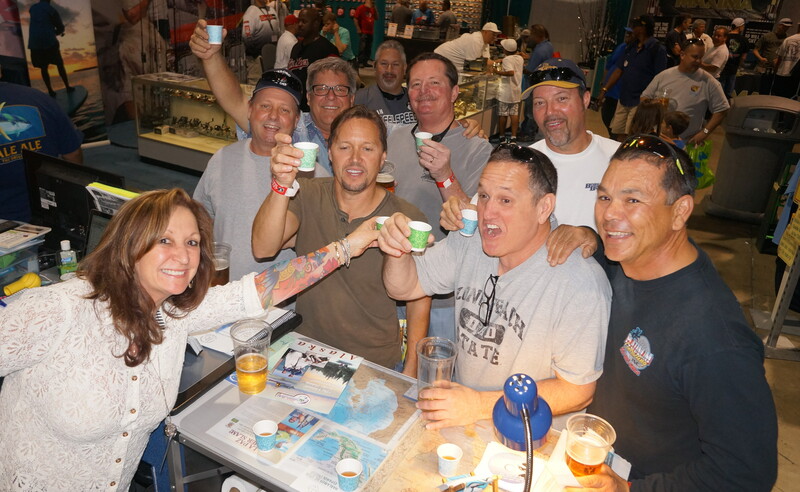 The scene at our booth in Long Beach two weeks ago as Jill and Don Busse and his gang of amigos toast the upcoming fishing trip returning to fish with us in October! 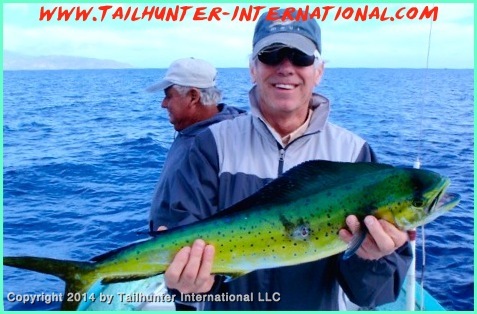 Our Tailhunter 2014 Road Tour started at the end of December and it’s finally coming to an end..sadly! Because we’ve had a blast driving all over the country and visiting so many of our amigos at the west’s largest fishing and hunting shows! We’ve been doing it now for almost 20 years! 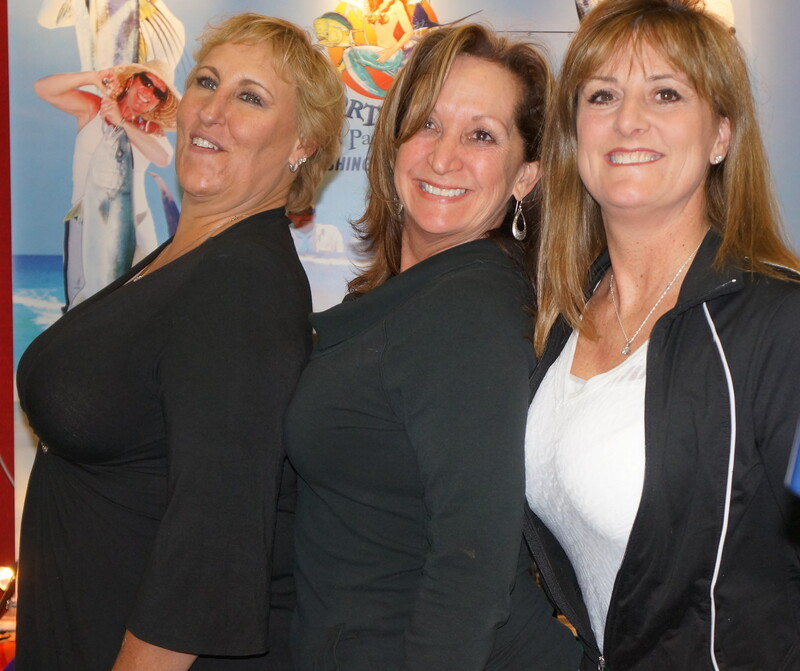 Our road show started with us driving from San Diego to the Sacramento ISE show….then across to the Denver ISE show…then to the Puyallup Fairgrounds in Washington. Then it was just south to the Portland Expo Center. From there to the fairgrounds in Yakima, Washington. We then took that long drive from Washington all the way to the Phoenix ISE show at the football stadium. Then back north we went to Boise, Idaho for another great show. Then back south to the Long Beach Fred Hall Fishing and Boating show. Last week we drove to Salt Lake City at the ISE show there in Sandy, Utha. Now, we’re here in San Diego! Finally! What a long fun trip it has been! We rocked! Also, click on the video below! This is more like it for March fishing! Joe Arata of Pacifica CA strikes the hot pose with a slugger yellowtail he took on the iron off Cerralvo Island. Yellowtail were a bit more predominant this week. What the heck! Roger Thompson is one of the best anglers we know. He was throwing the iron for yellowtail and said his jig barely hit the water when this big-time marlin smacked into it! On 40-pound test, he battled the big billfish for over an hour! Attempts to release the fish were not successful and the meat was donated. Marlin generally don’t show up for another 3 months or so! Just another indication that we’re going to see more warm water species showing up! 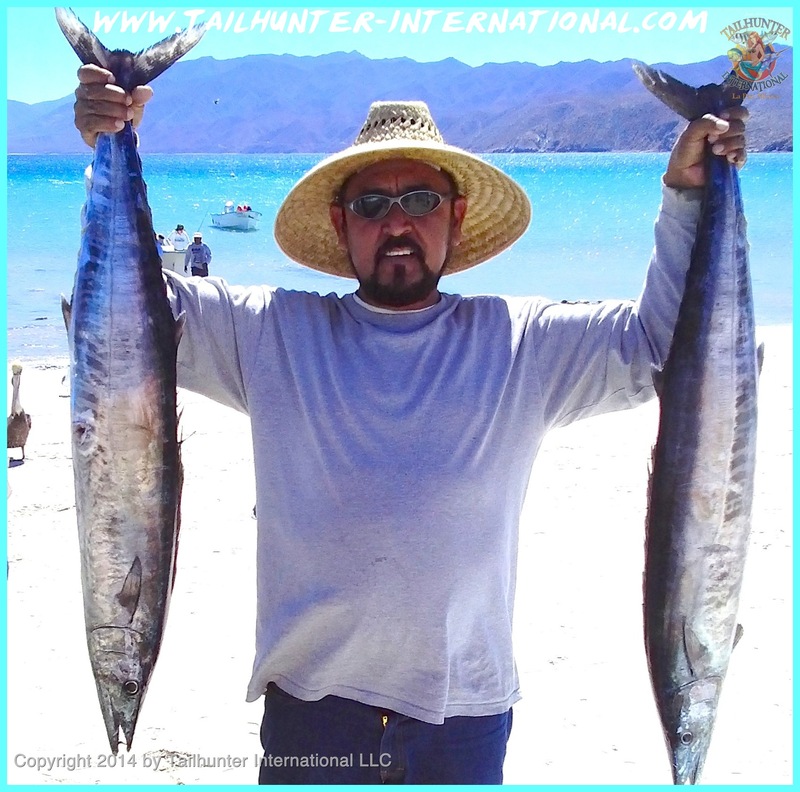 Brian ONeill an Leif Dover are clowning with a hefty pair of yellowtail on the Beach at Bahia de Los Muertos by holding the fish close to the camera. Still…even without them goofing, this pair of yellows are still trophy fish! Both our amigos are from Georgia! Best show of the season? Maybe so! Just finished up the mighty Fred Hall Fishing and Boating Show at the Long Beach Convention Center that went from Wednesday to Sunday! 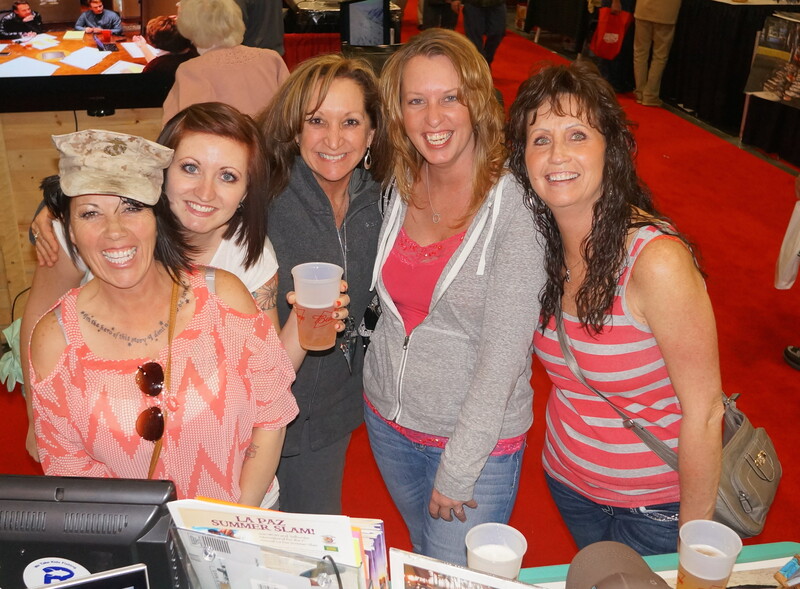 We hear it broke attendance records and the place was packed and the Tailhunter Booth never had a dull moment! 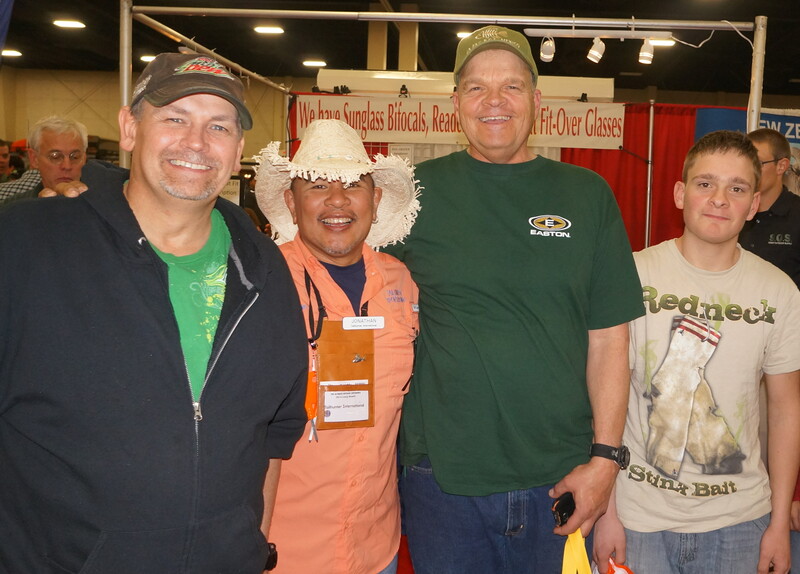 Don Busse (far right) brought over his merry group to toast us with Jill leading the saludos at our booth! 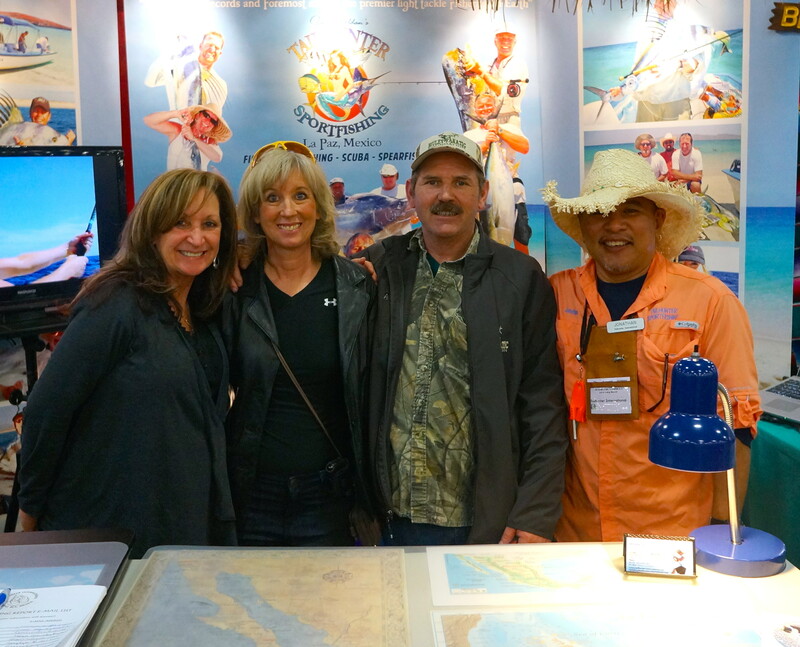 We saw a zillion friends and booked lots of fishing trips for 2014 to La Paz! Thanks, Long Beach! Thanks to everyone! No onto Salt Lake City! CAN IT GET STRANGER? WATERS WARM AND BRING TOP WATER SPECIES! The strange week early season continued this past week with more un-characteristic biters all week, but especially early in the week. In what seems like we may have by-passed our cold-water season and got right into spring-like conditions, we continue to hook up with a crazy variety of fish indicative of waters that are unseasonably warm! We did get a few more big yellowtail this week, but the numbers are way off from what they should be. Normally, this time of the year, we are hammering big 25-40 pound ‘tails and getting 2-5 per panga not counting the ones we lose! Instead, we are only getting about 3 – 10 per week! That’s it. They are a nice grade of fish, but the counts are not what they should be. However, don’t panic! The slack is being taken up by other fish including dorado, wahoo…even marlin and we got a tuna (reportedly a 24-pound class yellowfin was taken!) this week as well. All of these are normally warm water species that we don’t see for another 2 months or so! Mixing that in with some cabrilla and pargo and it’s making for an interesting “chop suey” of fish in the fish box these days. Will it continue? I have no idea. We seem to get new surprises every week! Two things can happen. The waters will continue to warm in which case, forget the cold water species like the yellowtail an sierra and such. They’ll go deep or leave the area far too early! Secondarily, they water will suddenly get cool and cold and we’ll lose the warm water species and by then it might also be too drastic of a change for the inshore species. I tend to think the waters will continue to warm so look out…it’s going to be a season of early big fish! We’ll keep you posted for sure. LONG BEACH ROCKED! NOW HEADED TO SALT LAKE ISE SHOW! Our booth in Long Beach was visited by so many super amigos but we never expected so many dignitaries from La Paz to come up as well including our amigo Agustin Olachea, head of the La Paz hotel association! It was great to see him at the show helping to promote tourism in our city! 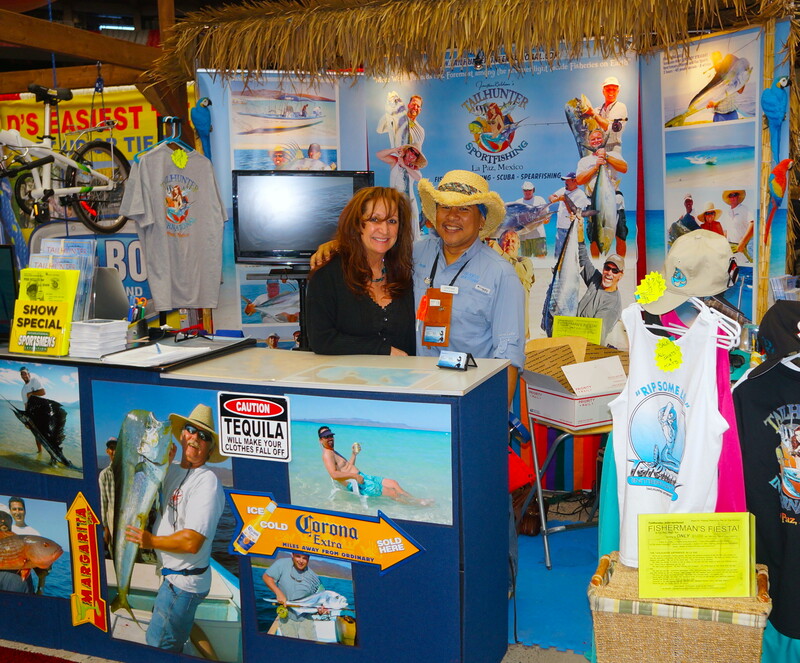 We had an incredible run this past week at the Fred Hall Fishing and Boating Show at the Long Beach Convention Center. 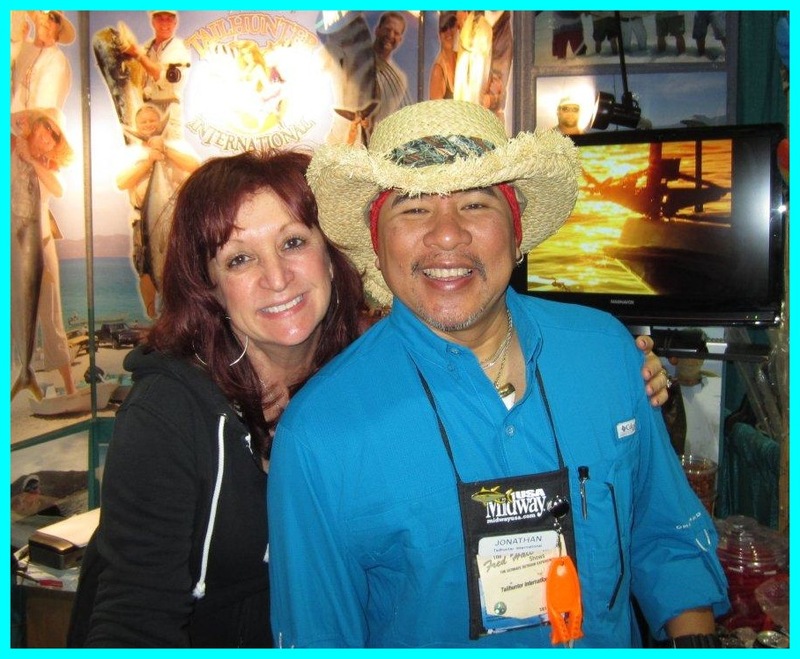 What a slamming good time seeing so many of our S. Cal friends and so many of our amigos in the fishing industry. It was often shoulder-to-shoulder in the aisles and the din of the crowd was so raucous that we had to yell to be heard! Couldn’t have been more fun and I also got to celebrate my birthday in the middle of about 10,000 of my best friends like I do every year! Thanks to everyone who came by to chat about fishing in La Paz and also wish me another good “trip around the sun!” It was a grand time! Click that link for information as well as show times and discount tickets! There’s always a ton of fishing, hunting, camping, boating and other outdoor related gear, info and other stuff for the whole family. See you this week! 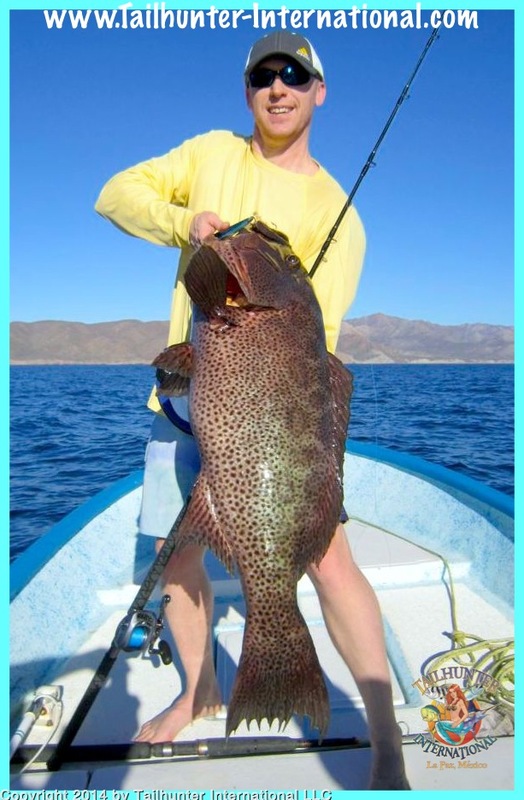 In 20 years running our operations in La Paz, I’ve not had anyone pull up a big broomtail grouper like this. Leif (“Don’t call me “Garrett”) Dover from Atlanta GA has been fishing at least 2 times a year for many years and always sticks fish with us. He said this fish slammed into his jig and almost pulled him out’ve the boat. This is not just a trophy fish, it’s also an unusual catch! Fishermen come for years trying to stick a trophy wahoo. Don Asp came down on his first trip from Minnesota and rips this sweet ‘hoo! He’s just trying to catch some sunshine and get in a little fishing. 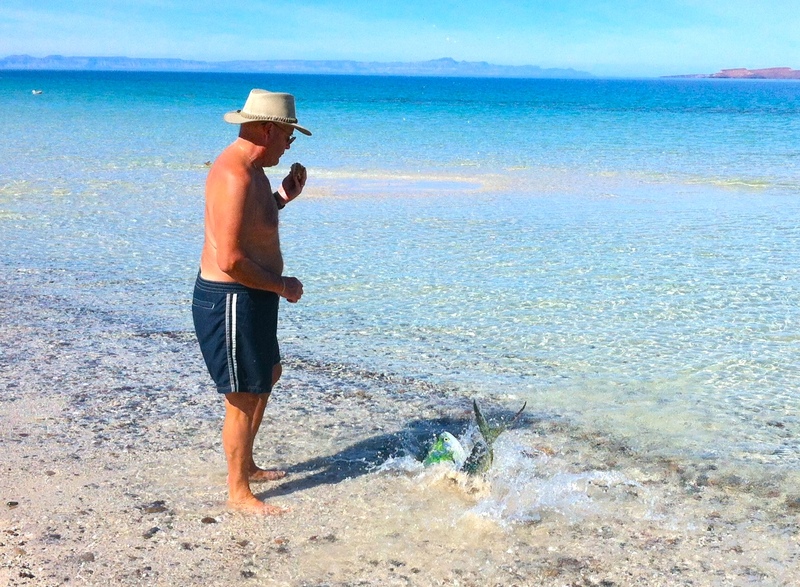 Instead he gets on of the most prized fish in Baja. 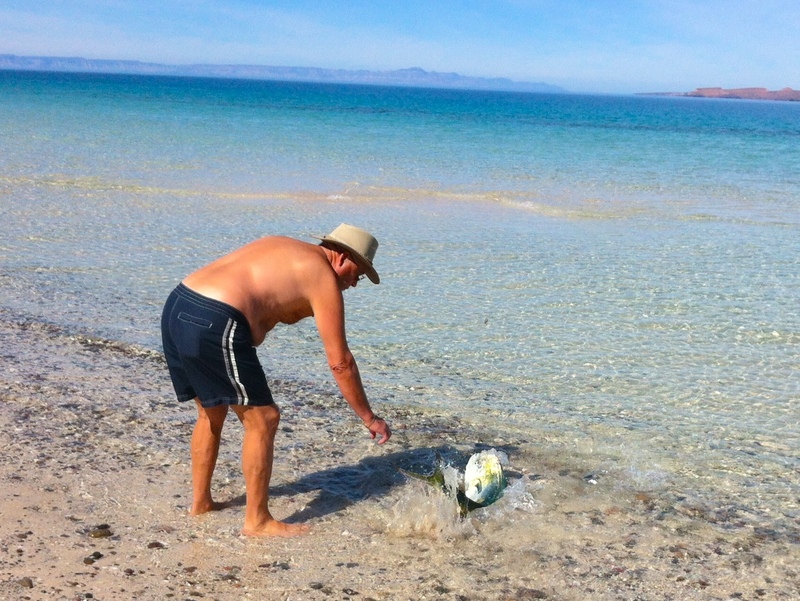 He’s on the beach at Bahia de Los Muertos. Lots of wahoo this week. Unbelievable. 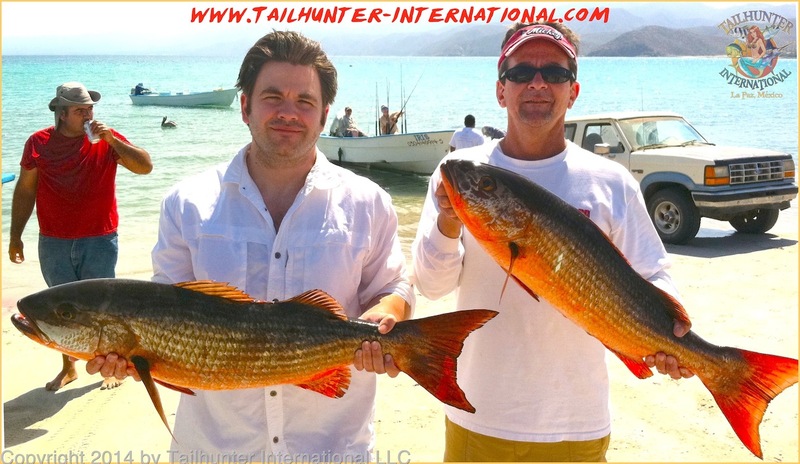 Ken Gragg (left) is one of our best amigos who fishes with us at Tailhunter several times a year and came down this past week with his son, Steve. They found the schools of big pargo liso off the rocks near Las Arenas. Tough fish to put in the boat! Brian O’Neil gets a funny look from our Tailhunter Moncho as Brian struggles with a wiggling big amberjack and not get stuck by the jig. First big amberjack of the season for Brian! 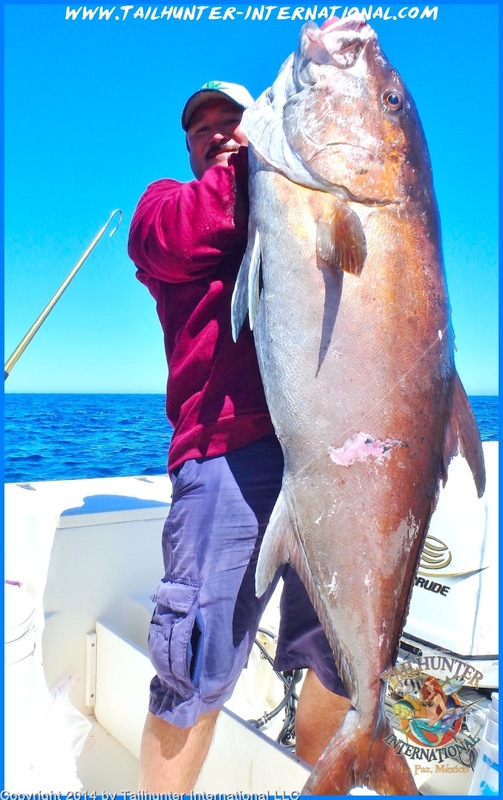 OK…this one turned out to be the biggest amberjack of the week…maybe the year! Look at this beast that Capt. Hugo hung! 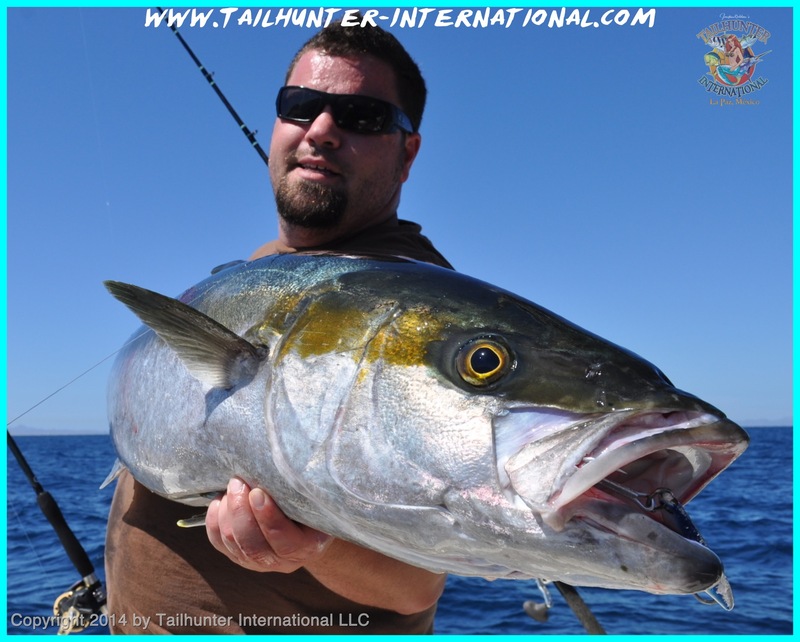 The amberjack is the delicious big cousin of the yellowtail. These are generally not caught in our waters until later in the spring! Amigo, Roger Thompson, was on the boat and took the photo. Thanks, Rog! Shellee Mittan from northern California and her husband, Bill, only had time to squeeze in one day of fishing and got some cabrilla (released) and these two nice sierra. We have missed our amigo, Daryl Valdez from Bakersfield CA who usually visits us every year, but hasn’t been down in a bit. 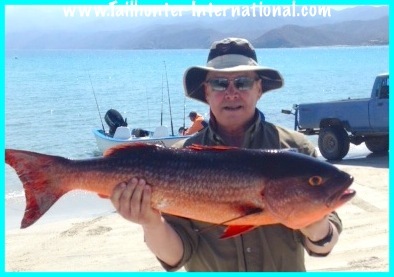 Great to see him and he got the largest pargo of the week…this fish estimated at 20-25 pounds. Nice forktail! 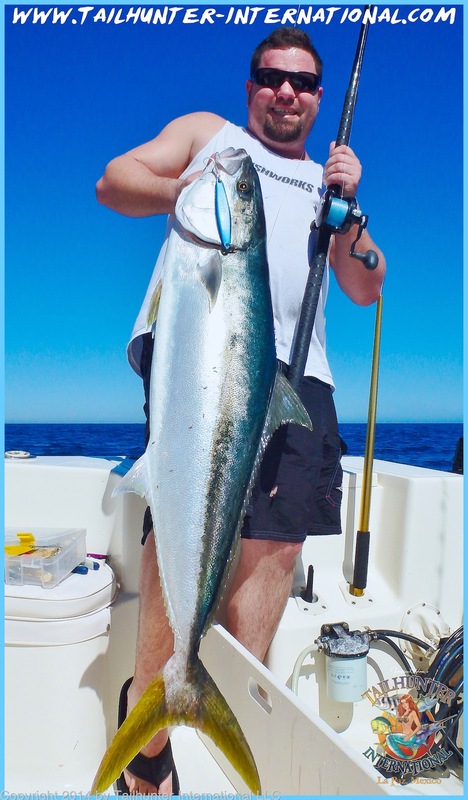 Joe Arata from Pacifca CA dropped a blue and white iron overboard and stuck it to this fat yellowtail off Cerralvo Island. 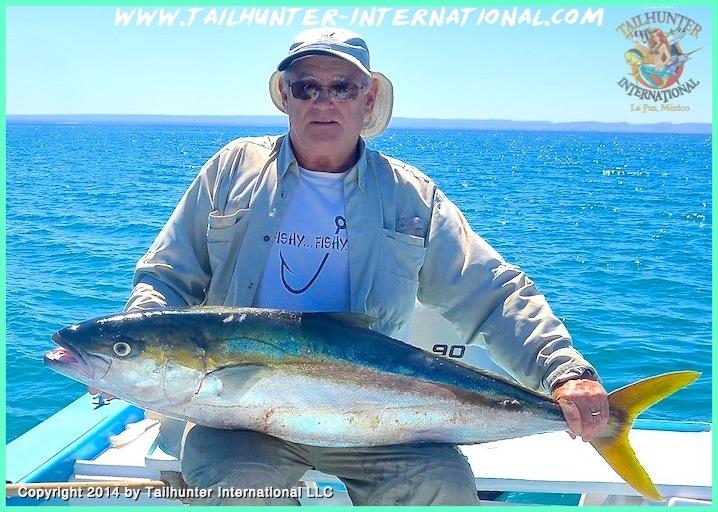 The yellowtail haven’t been as prevailant as normal as water temps and bait conditions have been variable. 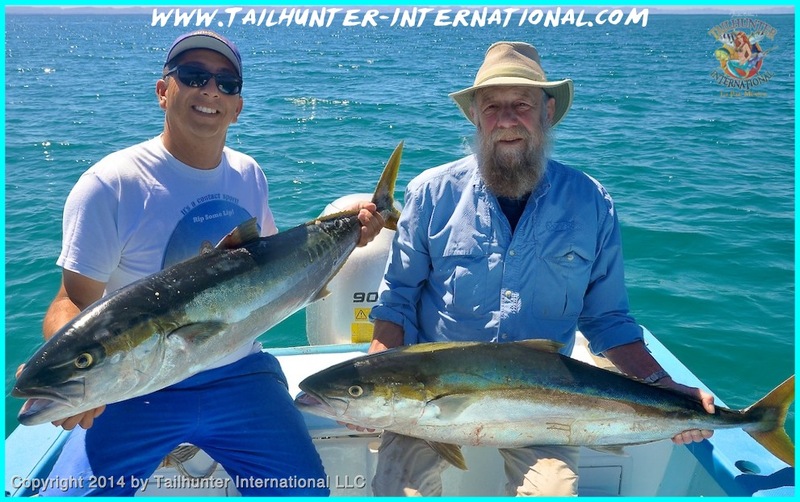 Dave Lue and Chad Gagnier were visiting us for the first time and fishing with Tailhunter and show off their first day of fishing with 2 wahoo plus dorado. The anglers are from Georgia. 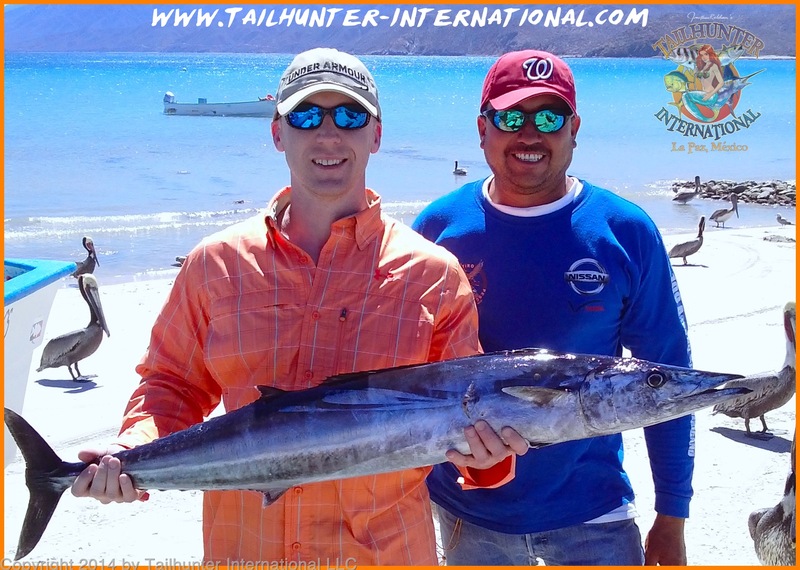 First day hot stick, Leif Dover and Captain Moncho pose with another wahoo taken off Cerralvo Island. THE MOST AMAZING CRAZY WINTER WEEK OF FISHING! This might have been the craziest week of winter fishing we’ve seen in our many years here. Mainly, it’s because it wasn’t winter fishing! I’m not sure what to call it or what to say about it! In all honesty, the fishing action was really only so-so. We had a good number of anglers out there and it wasn’t crazy wide-open by any stretch. And it was better earlier in the week than later when it seemed to taper off. However, what it lacked in numbers was made up for in quality. Great quality. Unbelievable quality. Just look at the photos! Now, normally this time of year, we’re chasing cold water inshore fish. 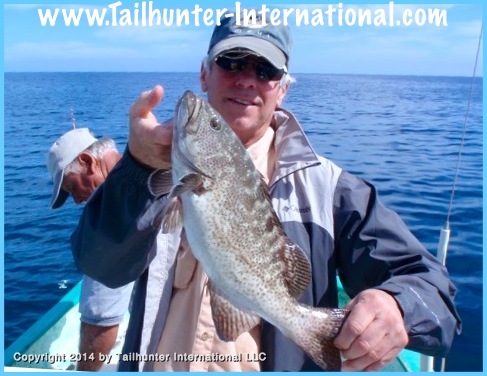 Species like sea bass (cabrilla), pargo (snapper), jack crevalle, pompano, sierra and the like. If conditions are right, we’re also getting the big pig yellowtail as well. Well, the last few weeks we started getting some really strange biters and I think it culminated this week. In fact, it was a great indescribable week relatively speaking. We did find the pargo. Some big ones right off Punta Perrico. 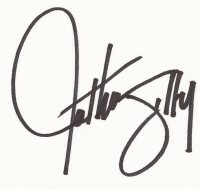 But, we also got…get this..(drumroll)….wahoo! Dorado! 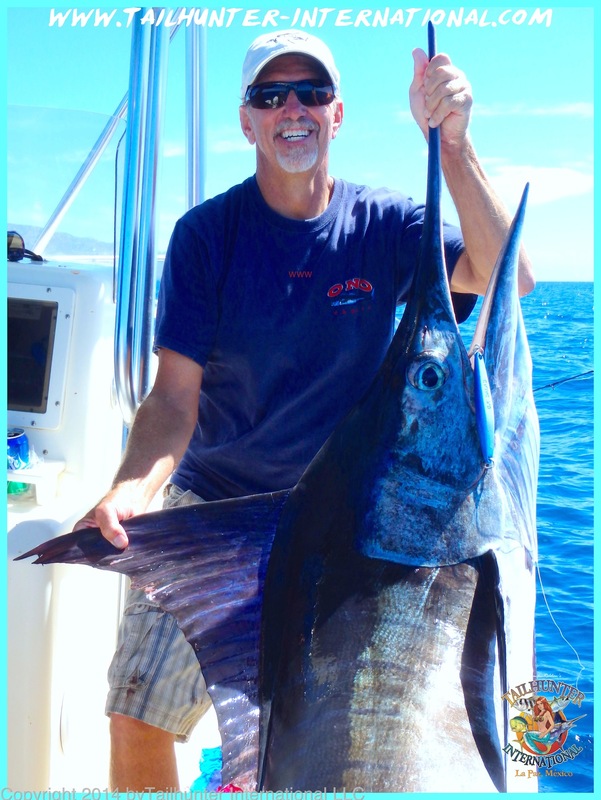 A 180-pound striped marlin! Amberjack! 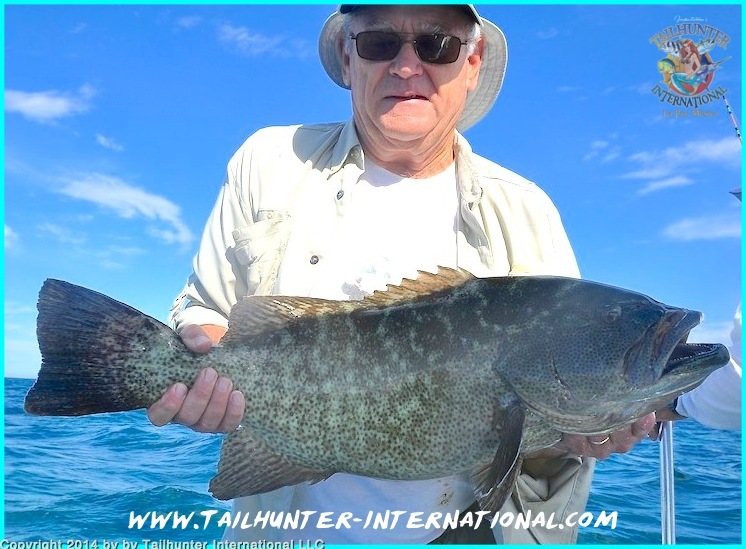 And even a huge broom tail grouper! Maybe it’s the water temps being a little warmer than normal. Maybe it’s the lack of mackerel that usually draw the yellowtail up from the trenches. But, I have never seen a winter like this where we’re getting these species. Sure, every now and then someone gets one, but to have all of these species biting at the same time? Literally unheard of! But, the anglers sure stuck some fish. Bait was still an issue, but using ballyhoo and slow trolling Rapalas and also those guys who dropped yo yo iron did well. Hot spots were all around Cerralvo Island, around the north and south ends were especially good. But also around Punta Perico fish were found. We’ll just have to keep an eye on things! 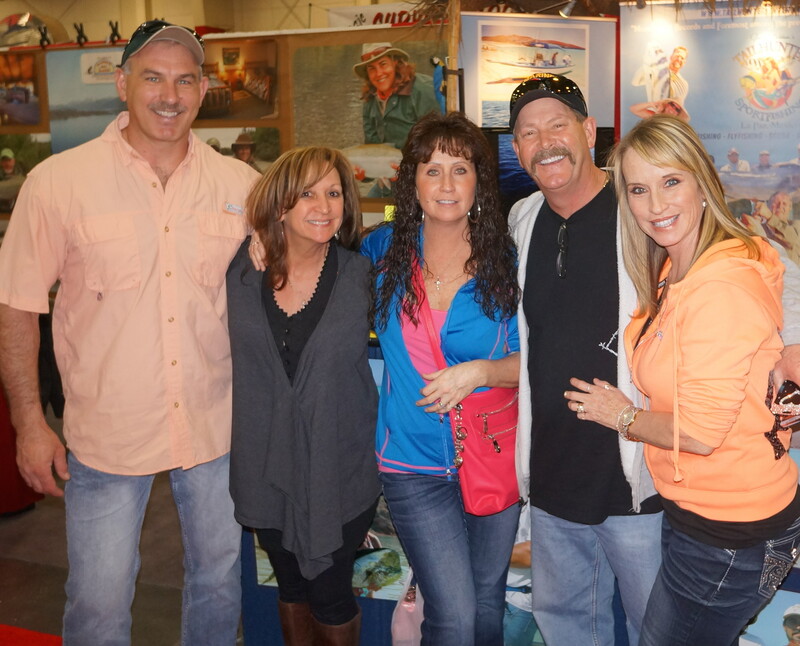 Thanks to all of our new and old amigos in Boise who came to see us at the Idaho Sportsmans Show! We were slammed and had the best show of our 2014 sports tour! 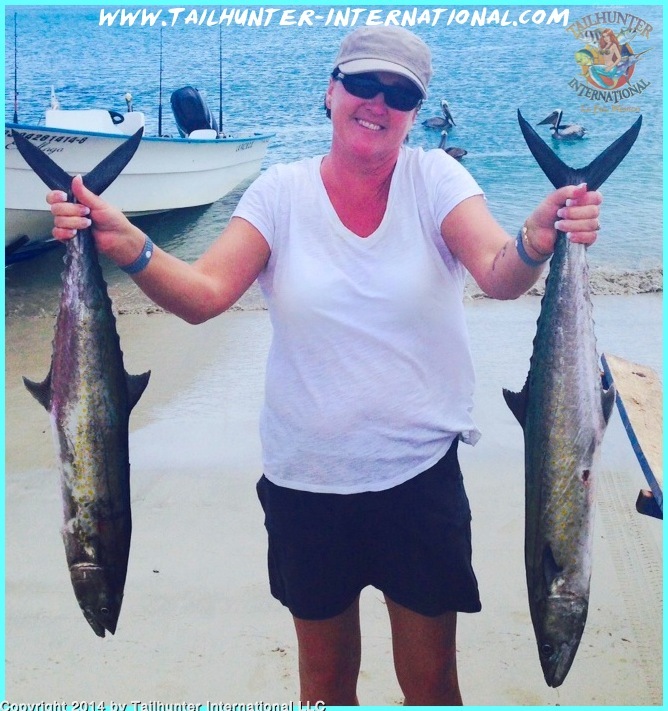 Lots of reservations for fishing with us this year and we’re looking forward to all the visit! 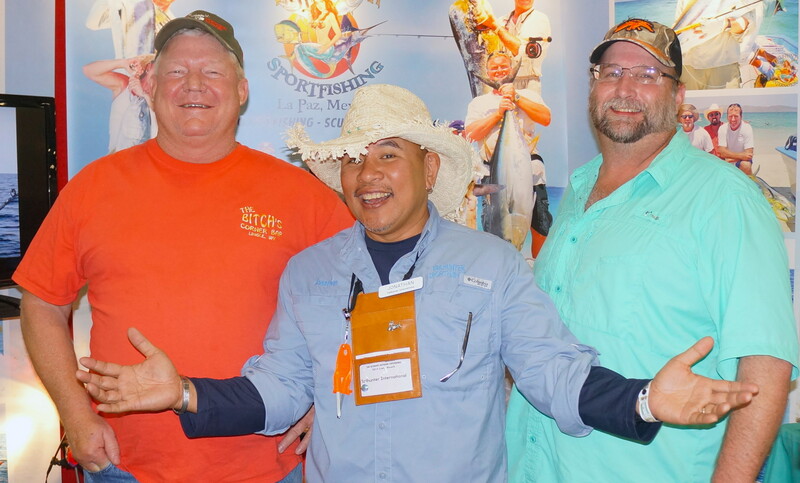 But now…we head to the big boy show of shows…the FRED HALL FISHING and HUNTING SHOW at the Long Beach Convention Center starting this Wednesday to Sunday! We can’t say enough about this past week show at the Idaho Sportsmans’ Show in Boise Idaho. Thanks to everyone! The show was packed and our Tailhunter booth was slammed. We had some of our best day of the 2014 tour this past week and booked lots of new reservations for fishing this year! Just spectacular! We head to the grand-daddy of shows! The Fred Hall Fishing and Hunting Show starts Wednesday and goes through Sunday at the Long Beach Convention Center. This show is huge so bring your walking shoes! There’s tons to see for the whole family. It takes some folks several days to walk through all the displays; check out all the gear for sale; check out the seminars and make their way through the whole show. This is a huge party. If you’ve never attended it’s the Woodstock of fishing shows on the West Coast. Come see us. We’ll be in our booth in our usual place in the middle of tackle row, next to Izorline fishing line and Whopper Stopper fishing rods. This is gonna be fun!